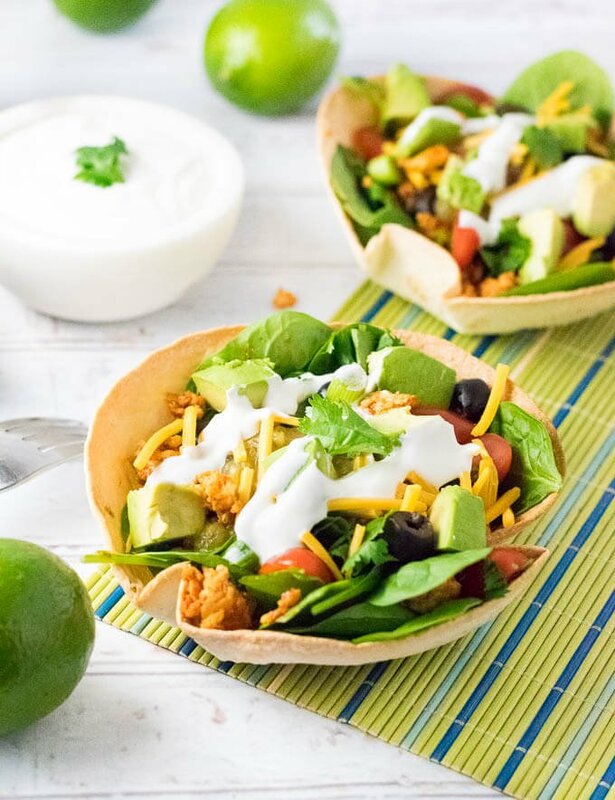 This Healthy Chicken Taco Salad is loaded in a homemade taco bowl brimming with spinach, avocado, and more, then drizzled with a tangy lime sour cream sauce. Why did the chicken cross the road? Because it was a free-range chicken… Yay for healthy chicken jokes! I had debated making this taco salad with extra lean ground beef instead, but there just weren’t any good cow jokes to lead off with. So a chicken taco salad it is! This chicken taco salad makes a hearty main dish that you can feel good about serving your family. Loaded with fresh produce, and lean ground chicken, it is a great alternative to more traditional taco dinners. However, if you are craving a ground beef taco salad, you will want to check out my Taco Salad with Doritos. It isn’t as healthy, but it tastes phenomenal. I would also be remiss if I didn’t mention my Taco Dip recipe, it is a classic for a reason. 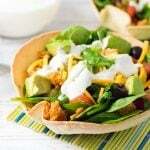 A classic taco salad is served in taco bowls. Often taco bowls are fried corn tortillas which certainly subtracts from the healthiness of the meal. 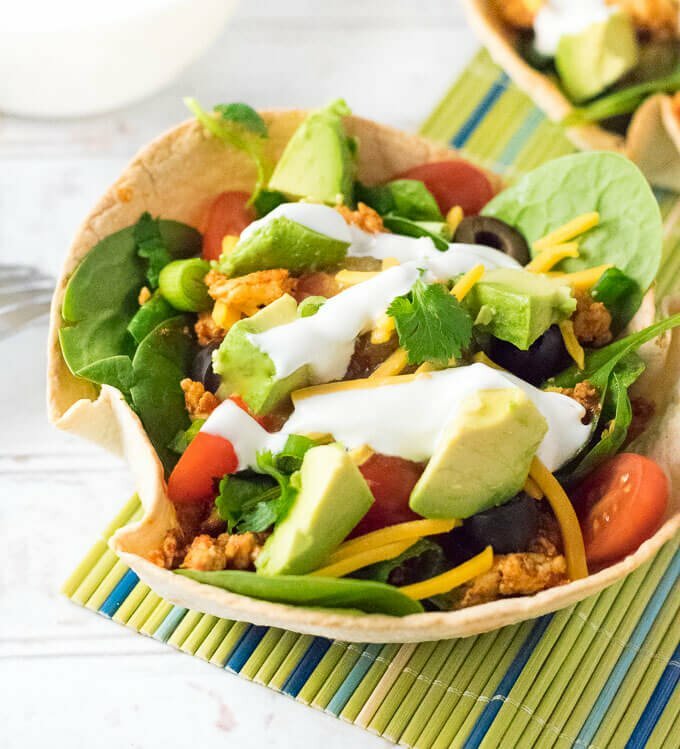 You can make taco bowls out of tortillas instead, though using whole wheat tortillas is certainly the healthiest option for a chicken taco salad bowl. Making homemade taco bowls is actually quite easy. They just need to be painted lightly with oil, formed into a bowl, and baked until crisp. The easiest way I found to form them into a bowl is to put them into an oven-safe bowl and press the tortilla into the bowl’s shape. Otherwise, I have also seen people place the tortilla upside down on a baking sheet over a large ball of foil to help the tortilla keep a bowl shape. I didn’t include it in this taco bowl recipe, but I think lightly dusting the tortilla with taco seasonings would add a lot of flavor. Creating a healthy taco salad starts with lean meat. Traditional taco meat is typically fatty, but you can still pack all of the great taco flavors into lean ground chicken, and never miss the fat. I also substitute baby spinach for iceberg lettuce for additional nutrition and flavor, and you can feel good about loading up the salad with plenty of fresh produce like avocados, black olives, and grape tomatoes. The chicken taco salad does include cheese and sour cream, which aren’t always the healthiest options. However, you can substitute light sour cream if desired, and when used in moderation sour cream and sharp cheddar cheese can certainly be part of a healthy salad. Often chicken taco salads are made with chopped or shredded chicken breasts, or even making a chicken taco salad with rotisserie chicken would be exceptional. You can certainly use any of those options with my chicken taco salad recipe instead. However, I do love the flavor of lean ground chicken because the lean crumbles of meat really soak up the taco seasoning in a way the whole chicken just can’t. If using chicken breasts, or rotisserie chicken, use the taco seasoning in smaller quantities to simply dust the exterior of the chicken. Place tortillas in the oven for around 15 minutes, or until crisp and beginning to brown, then remove from oven. Combine sour cream, lime juice, and milk in a dish and whisk to combine into a sauce. Set aside. While taco shells bake, place ground chicken in a medium skillet over medium heat and cook until browned, and break apart into crumbles..
Add water and taco seasoning to the skillet (water helps the seasoning disperse evenly), stir to evenly coat the chicken and cook until water has evaporated. Turn off heat and let chicken cool slightly. 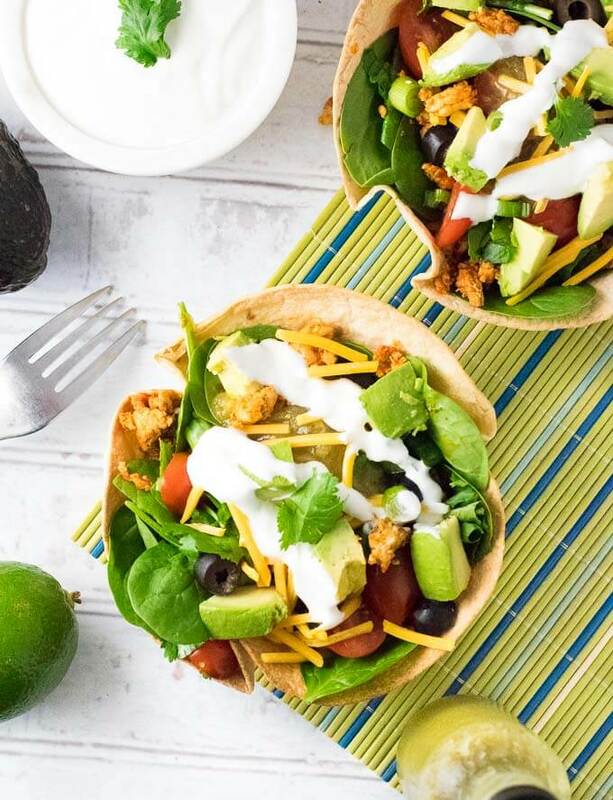 Fill taco bowls with baby spinach, and sprinkle in ground chicken, grape tomatoes, green onions, black olives, cheddar cheese and avocados to taste. Add a few spoonfuls of Verde salsa over the salad and drizzle with Lime Sour Cream Sauce. For a tangy twist, add my quick pickled red onions to the taco salad as well! If you enjoyed my Healthy Chicken Taco Salad recipe then you should probably like me on Facebook and follow me on Pinterest too. That’s what I would do at least, because if you don’t get to know me but you still use my recipe it is kind of like taking candy from a stranger, and your mom taught you not to do that. Don’t disobey your mom, subscribe to Fox Valley Foodie today.